Heart disease (all types) is the #1 cause of death in adults in the US. One type -- coronary artery disease -- is highly preventable by adopting a good diet and performing aerobic exercise (even brisk walking works) regularly. Resistance exercise (weight-lifting) is not effective. The pun created by the title of this story is intentional. Obesity is on the verge of becoming the #1 healthcare issue in the US. The rate of obesity is increasing so rapidly that, if something doesn't change, it is predicted by the year 2050, every single adult in the US will be overweight. Roughly 15 years ago, the media and the medical profession identified obesity as not only a personal health issue, but as an impending medical crisis (Manson JE, et al. 2004) (Vastag B. 2004). Those predictions have come true: Data from the ongoing National Health and Nutrition Examination Survey (NHANES) show that, during 2013-2014, 35% of men and 40% of women in the US are now obese (defined as a BMI > 30) (Flegal KM, et al. 2016). Perhaps more concerning, 20% of adolescents are classified as obese (Ogden CL, et al. 2016). These are the worst statistics yet on obesity in the US. • Fifteen years ago, roughly 30% of adults in America were obese (BMI > 30) (Bonow RO, et al. 2003) (Flegal KM, et al. 2002). As mentioned above, now it's up to 35% for men and 40% for women. • In 1991, no state reported obesity rates higher than 20%. In 1999, 16 states reported rates above 20%. More recent data from the CDC show that the prevalence of obesity in Medicaid recipients ranges from 21% in Rhode Island to 44% in Indiana. • Class 3 obesity is defined as a BMI of 40 or higher. A BMI of 40 is equivalent to a person who is 5'10" and weighs 278 lbs. Class 3 obesity in adults has more than doubled in 10 years, with a prevalence of 2.2% in 2000 (Freedman DS, et al. 2002). Yale public health expert Dr. David Katz offered this ominous prediction: "Today’s kids may be the first generation in history whose life expectancy is projected to be less than that of their parents." Obesity is now a worldwide problem. The International Obesity Task Force reported in 2004 that roughly 1.7 billion people worldwide weigh too much. Of those, about 312 million are defined as obese. At that time, the world population was 6.2 billion. Thus, one out of every 4 persons on earth was already overweight! As of early 2018, the world population is 7.6 billion. According to Roland Sturm, PhD, senior economist at Rand Corp., obesity has about the same association with chronic health conditions as does 20 years of aging. This greatly exceeds the impact of smoking or problem drinking on overall health. In other words, becoming obese is a lot harder on the body than smoking or drinking. • Diabetes Mellitus: An all-too-often companion to obesity is diabetes, which is a very serious health problem. Obesity leads to insulin resistance, which, in turn leads to type 2 diabetes. In the past, type 2 diabetes was thought to mostly affect adults. However, an alarming increase in type 2 diabetes has been seen in children. This is thought to be directly related to the increase in obesity in this age group (Sinha R, et al. 2002). • Heart Disease: A variety of diseases of the heart occur at higher rates in the obese: angina (Wilson PWF, et al. 2002); atrial fibrillation (Wang TJ, et al. 2004); coronary heart disease (Manson JE, et al. 1990) (Wilson PWF, et al. 2002); and heart failure (Kenchaiah S, et al. 2002). • Hypertension: Separately, hypertension and obesity each affect millions of people. Hundreds of research papers have described the relationship between these 2 diseases. Some researchers believe that controlling obesity might eliminate as much as 48% of hypertension in whites and 28% of hypertension in blacks (El-Atat F, et al. 2003). • Stroke: In the Nurses Health Study, over 116,000 female nurses followed for 16 years revealed that women with a BMI > 27 had an increased risk of stroke (specifically, ischemic stroke) (Rexrode KM, et al. 1997). In a study of male physicians who were followed for 12 years, those who had a BMI > 30 were at a significantly higher risk of stroke (either type) than those with a BMI of < 23 (Kurth T, et al. 2002). • Metabolic Syndrome: The metabolic syndrome is a combination of obesity, hypertension, glucose intolerance (insulin resistance), low levels of HDL-cholesterol, and high levels of triglycerides. The incidence of metabolic syndrome was found to occur in 4.6% of persons with normal weight, in 22.4% of overweight, and in 59.6% of obese persons (Park Y-W, et al. 2003). • Cancer: A study of over 900,000 US adults, reported in the New England Journal of Medicine in 2003, revealed that increased body weight was associated with an increased death rate from cancer (Calle EE, et al. 2003). • Gall Bladder Disease: In the Nurses Health study, over 90,000 women were followed for 8 years. This study showed that women with a BMI above 45 had a 7-fold higher risk of gallstones than a woman with a BMI of less than 24 (Stampfer MJ, et al. 1992). • Osteoarthritis: Men and women with osteoarthritis of the knee typically have a higher BMI (Hochberg MC, et al. 1995). • Infertility and Sexual Disorders: Obese women who lose weight show improvements in menses pattern and fertility (Pasquali R, et al. 1997). Obesity has been associated with erectile dysfunction (Saigal C. 2004) and lower testosterone levels in men (Glass AR, et al. 1977). • Psychological Problems: Obese employees reported more difficulty getting along with coworkers (Pronk NP, et al. 2004). Extreme obesity is associated with depression (Dong C, et al. 2004). • Sleep Apnea: Abnormal breathing patterns during sleep are strongly related to obesity, particularly in men (Young T, et al. 1993). According to Roland Sturm, PhD, health care costs are one-third higher for an obese individual vs. a non-obese person. A severely obese person (ie., a BMI value of 35 or higher) is associated with a 60-70% increase in costs. And a person with a BMI of 40 or more doubles the health care costs compared to what a normal weight individual spends. A recent study conducted by Mayo Clinic revealed that smoking was responsible for health care costs amounting to $1200-1400 per year. However, costs related to morbid obesity averaged $5400-5500 per year (Moriarty JP, et al. 2012). Severely obese workers missed significantly more days of work (Pronk NP, et al. 2004). This is another expense directly related to obesity. A person's intrinsic genetic make-up has been identified as one of the causes of obesity. • Animal data: Studies in mice support a genetic basis for obesity (Aitman TJ. 2003). • Research on Twins: In one study of Danish adoptees who were raised apart from their biological parents, it was found that the weight class of the child correlated more closely to the weight class of the biological parents than the weight class of the adoptive parents (Stunkard AJ, et al. 1986). Other data show that body mass index is more similar between identical twins than between fraternal twins (Sorensen TI. 1995). • Leptin: Leptin is a protein produced by fat cells. A mutation in the gene that represents the leptin receptor can lead to obesity. A family with many morbidly obese members was discovered to have a genetic defect in the receptor for leptin. Three obese siblings, all female, were found to be homozygous for a defective leptin receptor while the three non-obese siblings were found to be heterozygous. The homozygotes were very obese since childhood (Clement K, et al. 1998). • Resting Metabolic Rate: Why can some people lose weight so easily while the chronically obese can't? For example, Robert DeNiro gained nearly 50 lbs to play the role of Jake LaMotta in "Raging Bull" (1980), but was lean and muscular 10 years later in the role of Max Cady in "Cape Fear". Renee Zellweger also gained, and subsequently lost, a substantial amount of weight for her role in "Bridget Jones". When the obese go on a diet (restrict calories), their resting metabolic rate (RMR) also drops (Prentice AM, et al. 1991). One study showed after the obese lose weight, their 24-hr energy expenditure is 15% lower than lean subjects (Geissler CA, et al. 1987.). This is important because RMR accounts for about 75% of the total calories burned in a 24-hr period (Saris WHM. 1993). Further, exercise does not seem to be very good at preventing this reflex drop in RMR (Geissler CA, et al. 1987.) (Saris WHM. 1993). Despite all this evidence suggesting that the obese are genetically predisposed to gain weight, some researchers say: Forget genetics, and don't try to blame the fast-food industry; often, the obese are their own worst enemy. Research shows that a child with one overweight parent has a 40% chance of becoming overweight and if both parents are overweight, the probability rises to 80%. But, is this due to genetics, or is it simply a reflection of that child's lifestyle? Maybe this family simply eats too much. • Every day, Americans consume 47 million hot dogs and 3 million gallons of ice cream. Between 1972 and 1992, the per capita consumption of soft drinks rose from 27 to 44 gallons/year. Twenty-five percent of the vegetables eaten in the US are French fries (source: Time magazine, June 7, 2004). • Portion-sizes in US restaurants have steadily increased: From 1977 to 1996, the average cheeseburger increased from 5.8 oz to 7.3 oz; the typical serving of soft drink increased from 13.1 oz to 19.9 oz, and French fry portion increased from 3.1 oz to 3.6 oz. During the same time frame, total calories consumed per person per day increased from 1791 kcal to 1985 kcal (Nielson SJ, et al. 2003). • An interesting study of obese subjects and fast food: Two groups of individuals were allowed access to a fast-food lunch. The participants were allowed as much as they wanted. Then, the investigators evaluated what the subjects ate during the rest of the day. They found 2 things: (a) during the all-you-can-eat lunch, the obese consumed more calories than the non-obese; (b) during the rest of the day, the obese ate their typical amounts of food, while the non-obese ate less than their normal amount, thereby adjusting for the increased calories during lunch. 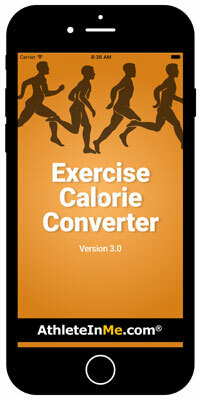 Use our Exercise Calorie Converter app to determine how long you have to exercise to burn off the calories in specific restaurant menu items. Currently, there is an anti-carbohydrate movement in the US: it has been estimated that anywhere from 20 to 30 million people are following a lo-carb diet. The Atkins Diet is well-known and is now widely endorsed by restaurant chains and food producers who are labeling some food choices as "Atkins Approved". Unfortunately, while Americans have jumped on the "anti-carbohydrate" bandwagon, there currently isn’t any universally-accepted definition of what constitutes a "low carb" food, as there is for the label "low fat" (defined as 3 g of fat or less per serving). Proponents for the "lo-carb" movement believe that the obesity problem in the US has its origin about 30 years ago when the shift away from fat and an increase in carbohydrates in the diet began. However, Andy Briscoe, president of the Sugar Association in Washington, DC, states: "Over the last 30 years, the per capita consumption of sugar — sucrose — has gone down from 72 pounds per person to 45 pounds per person a year. If sugar intake has gone down, then it's not as a significant contributing factor to the obesity issue as some people have made it out to be." The statement from Briscoe above needs to be kept in perspective. First, over the past 15-20 years, a large percent of the sugar used as a sweetener in food products has been replaced with high-fructose corn syrup (HFCS). High-fructose corn syrup is increasingly being blamed as one of the main causes of the obesity epidemic in the US (Bray GA, et al. 2004). Consumption of soft drinks, though it has leveled-off and even declined recently, is still in the range of 50 gallons per person per year. More importantly, most brands of soda-pop are sweetened with HFCS. Even if those soft drinks are being replaced by fruit drinks, often the sweetener in these beverages is also HFCS. Fructose is unique in that it does not stimulate insulin output to the same degree as other sugars (sucrose, glucose, galactose, etc.). Without an appropriate insulin response, leptin is not triggered. The lack of an appropriate insulin-leptin response after ingesting fructose is thought to be the reason why fructose does not suppress appetite as other sugars do. So, if you consume 300 kcal of fructose with a meal, these are 300 calories that don't participate in the feedback process that signals the brain to turn off the sensation of hunger. In effect, fructose calories "slide in under the radar", so to speak. As a result, you take in more calories before you feel full. Second, fructose appears to stimulate fat synthesis more readily than other sugars (Krilanovich NJ. 2004). Thus, some researchers feel that fructose, in the form of HFCS, is one of the major reasons why America is witnessing a major surge in obesity. Many obese persons claim that exercise doesn't work for them. However, that statement must be considered in the context of data from one study showing that the obese underreport their food intake by 47% and overreport the amount of exercise they do by 51% (Lichtman SW, et al. 1992). One of the reasons why exercise is not very effective for weight loss in the obese is that it represents a relatively small percent of the total calories burned in an average day. The largest percent of calories burned comes from routine daily activities. But, the obese simply don't "move around" as much during the day as do lean people. Researchers at Mayo Clinic made subjects wear a specially-designed body suit that tracked physical movement throughout the day, including movements as small as toe-tapping. Scientists call this "NEAT": non-exercise activity thermogenesis (Levine JA, et al. 1999). Assessments were made twice per second around-the-clock for 10 days. The researchers found that thinner people were more active than overweight people. Further, when thin people were overfed to make them gain weight, and heavy people were calorie-restricted, the change in each group's body size did not change their NEAT measurement (Levine JA, et al. 2005). To put this into more practical terms, the study showed that heavy persons sit about 150 minutes more each day than lean people do. This translates to 350 fewer calories burned each day by the obese person. Our sedentary lifestyle is affecting children, too. Children now spend more hours per week watching TV and playing video games than exercising. Children ages 2-11 years watch TV an average of 18.6 hours/week. By age 17, teenagers have spent 38% more time in front of the TV than they have in school. The average TV-watching child sees more than 10,000 (others place the estimate closer to 40,000) commercials a year, most of them promoting high-calorie food products. It has been estimated that for every hour of TV a child watches, obesity risks rise by 6% (source: Time magazine, June 7, 2004). This is why it's important to do all the "little" things throughout the day: take the stairs instead of the elevator; park at the far end of the parking lot when going to the store; carry your groceries instead of using the cart; get out of your car and go inside the bank or pharmacy or dry-cleaners instead of using the drive-thru, etc., etc. All of these activities help to burn calories. Put simply, Americans don't exercise enough. The CDC routinely conducts a telephone survey of Americans called the Behavioral Risk Factor Surveillance System (BRFSS). Data revealed that in 1998, only 25.4% of those surveyed engaged in the recommended level of physical activity, and 28.7% reported no physical activity at all (MMWR 2001;50:166-169.). At the end of the day (literally), whether a person gains or loses weight comes down to the ratio between calories consumed vs. calories burned. It's as simple as that. This relationship holds true even in extreme situations: Tour de France cyclists consume 6000-7000 calories per day yet still lose weight during the 3-week race! Thus, obese people not only exercise less than lean people, their daily activity burns fewer calories than lean people. When combined with excessive calorie consumption, obesity is the inevitable result. 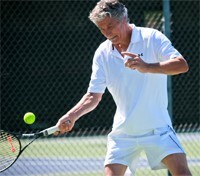 In 2005, researchers at the Mayo Clinic found that thinner people were more active each day than overweight people. The subjects wore a specially-designed body suit that tracked physical movement throughout the day, including movements as small as toe-tapping. Scientists call this "non-exercise activity thermogenesis" (NEAT) (Levine JA, et al. 1999). Assessments were made twice per second around-the-clock for 10 days. The study showed that heavy persons sit about 150 minutes more each day than lean people do. This translates to 350 fewer calories burned each day by the obese person. (Levine JA, et al. 2005). A report appeared in the New England Journal of Medicine evaluating the metabolic rate of subjects with a BMI of 27 or greater who claimed to have a "slow metabolism" as their reason for being unable to lose weight. Subjects were monitored for 14 days. The study revealed that these self-proclaimed "slow metabolizers" actually underreported their true food intake by 47% and overreported their physical activity by 51% (Lichtman SW, et al. 1992). Even though exercise may be difficult, and weight loss may be marginal in overweight and obese persons, exercise is still mandatory. Persons with a high level of cardiorespiratory fitness have a lower rate of cardiovascular events. This relationship holds true regardless of the negative health influences of obesity (Blair S, et al. 1996). In other words, it is better to be "fat but fit" compared to "fat and unfit". 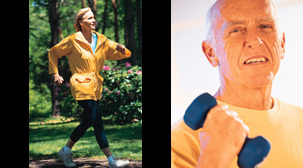 • Exercise stimulates the heart and lowers blood pressure...even if no weight is lost. • Exercise helps to keep the weight off after it is lost. So, obesity appears to be a result of a complex interplay of eating too many calories, eating the wrong foods (eg., high-fructose corn syrup, too much fat, etc. ), not enough exercise, and, at least in some, a genetic predisposition for weight gain. • 2003 marked the first year since 1998 that the percent of Americans who are obese did not increase. • Restaurant franchises are now providing details such as calories, amount of fat, and fiber content on their menus. • Grade schools and high schools are recognizing and endorsing the value of regular exercise by students. In the past, these programs have suffered due to funding cuts. • Because fats are the most calorie-dense nutrient, restrict the fat content in your daily diet to no more than 30% of total daily calories. • Increase your consumption of fruits and vegetables to 5-11 servings per day. • Exercise on most, and preferably all, days of the week, and drink a lot of water. Eliminate high-fructose corn syrup from your diet. Read the labels; HFCS is in lots of products. High-fructose corn syrup is found in soft drinks (soda-pop), artificially-sweetened fruit drinks, and many artificially-sweetened snacks. It's also found in pasta sauce, chocolate milk, and bagels. Increase the amount of fiber in your diet to 25-30 g per day (if you have GI problems, or, have had GI surgery, consult with your physician before doing this). Add fiber and drink a lot of water at every meal. You will feel full on fewer calories. Control your alcohol intake. Alcohol, as mentioned above, offers 7 kcal/g. Fortunately, beer and wine only contain 3-12% alcohol, so if you only have 1-2 drinks, you aren't taking in many calories. But, if you drink a pitcher of beer after every softball game, and you have 3 games per week, you are taking in a lot of empty calories in the form of alcohol.